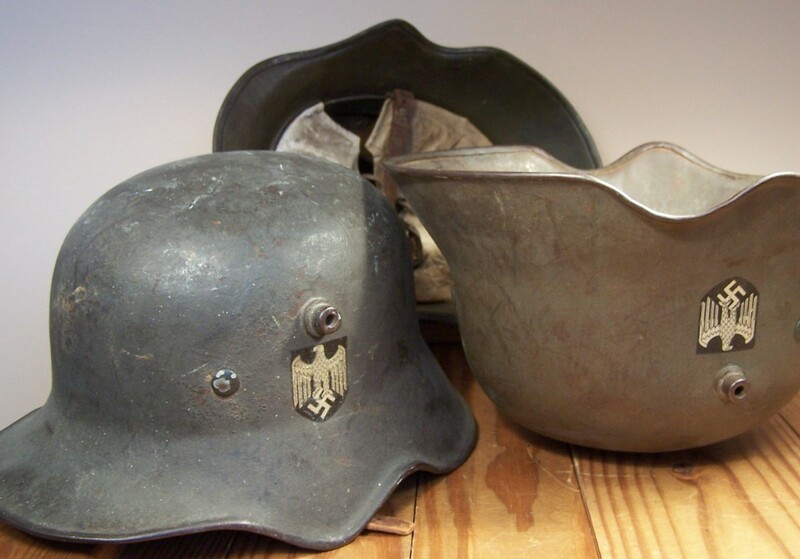 This is the place for all the assorted militaria related information, things I think are noteworthy, mixed with my "clever" gags and some dumb stuff. Stolen Valor ......Shameful! I feel cheated! I've been after this pile for over a year. The owner was a tough cookie, but we made a deal yesterday. The original veteran souvenir load (all from one person) was divided among family members. Below is what I bought from a different picker several years ago, but all part of the original bring home lot. What else is still out there?? What the heck is this??? Do you know?? I Do. It's a WWII bring back recently found in W Va. The answer is posted at the bottom of this page. This is the 1st one of these I have ever seen. It's a dress type buckle cast in one piece, of very light aluminum, but with an integral igloo type catch. 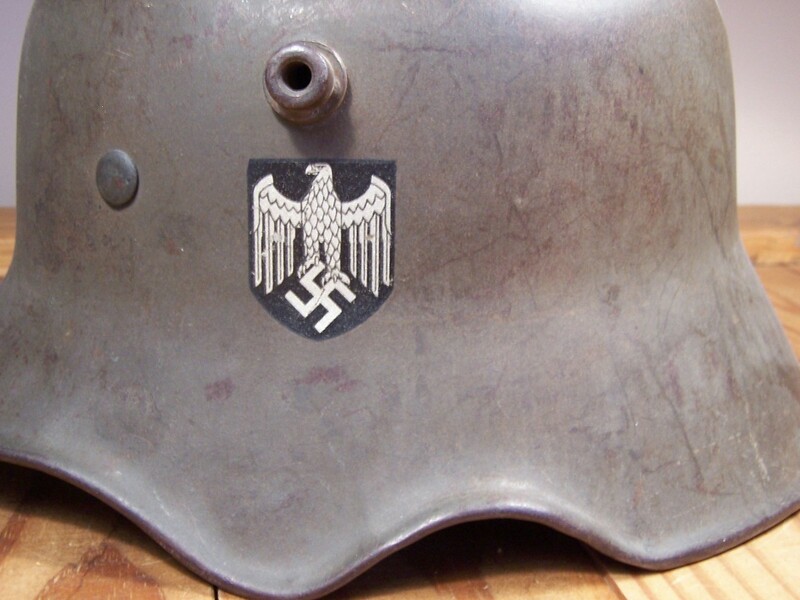 None of the recent books on Third Reich belt buckles, which I feel are very good, have any mention of this rare buckle. I welcome your comments. 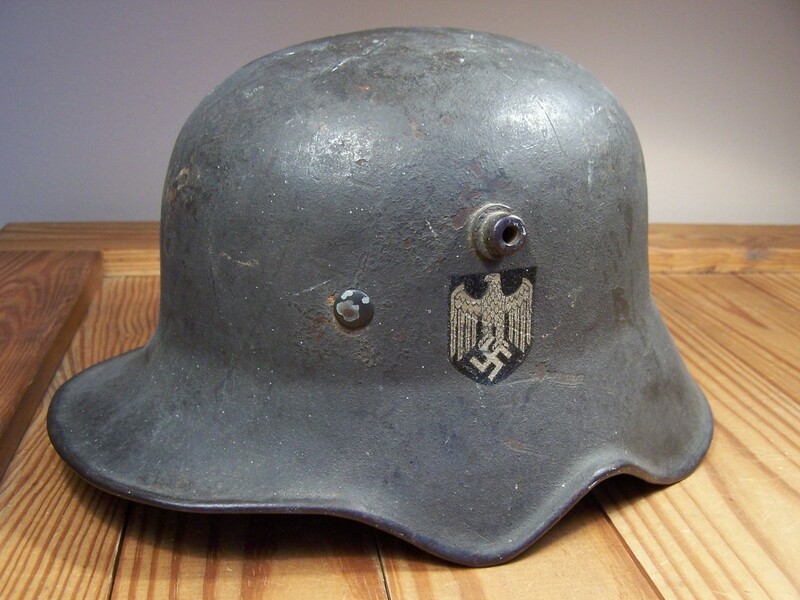 It's not for sale, but trade-able for other 3rd Reich belt buckles. What do you have?? I recently visited the home of Shifty Powers of Easy Company 506th Rgt.,101 Airborne, a.k.a. Band of Brothers in Clinchco, VA. Shifty is gone now, but his wife and son, Wayne, who still live in the family home, were very nice and invited me in for a visit. Clinchco, Va is way off the beaten path in the mountains of Western VA, and was not a quick easy excursion, but well worth it! I would like to thank Mrs. Powers and Wayne, for the wonderful visit! Please see the photos below. I recommend the book: Shifty's War by Marcus Brotherton!!! My family and I are form Prague, Czech Republic, and have military ties to the Hapsburg Monarchy of Vienna. During WWI, Czechs were required to fight for his majesty Franz Josef I and later, his nephew Karl. My Great Grandfather died on the eastern Front in 1914. 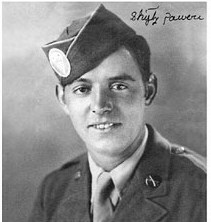 We do not even have a photo of him in uniform, but I am sure he went to war wearing the Hecht or pike grey service uniform. 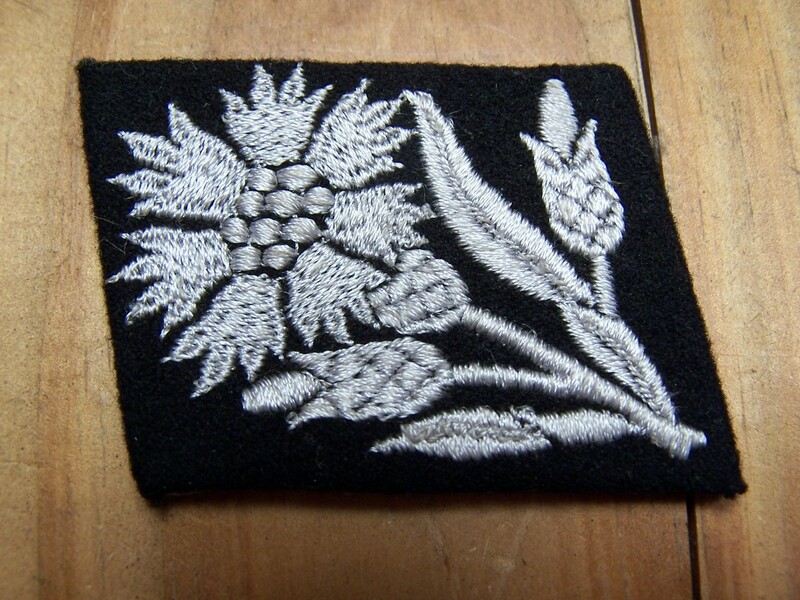 I had other more distant relatives serve in the Austrian Army during WWI. 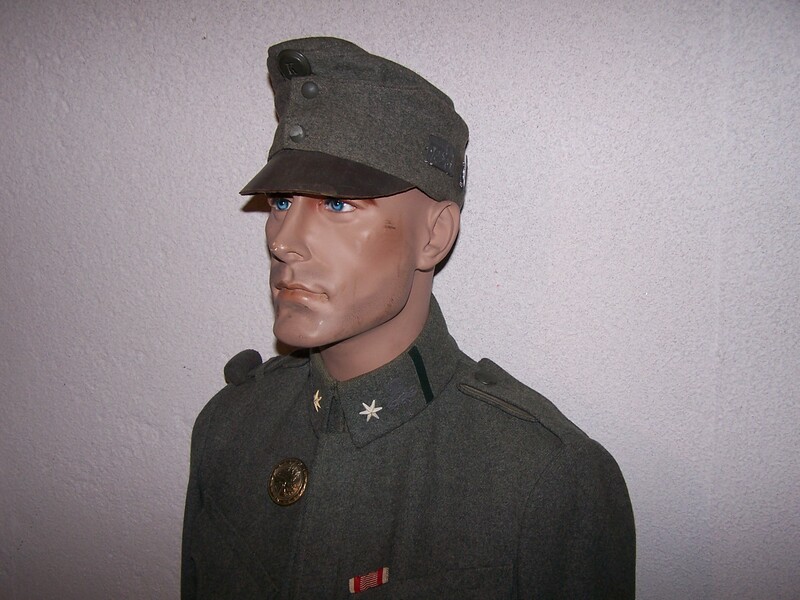 I have always wanted an Austrian Field Tunic, of grey or field grey wool. During my many trips to Prague in the old days, I just never found one. I saw the colorful dress tunics, but never the one I wanted. 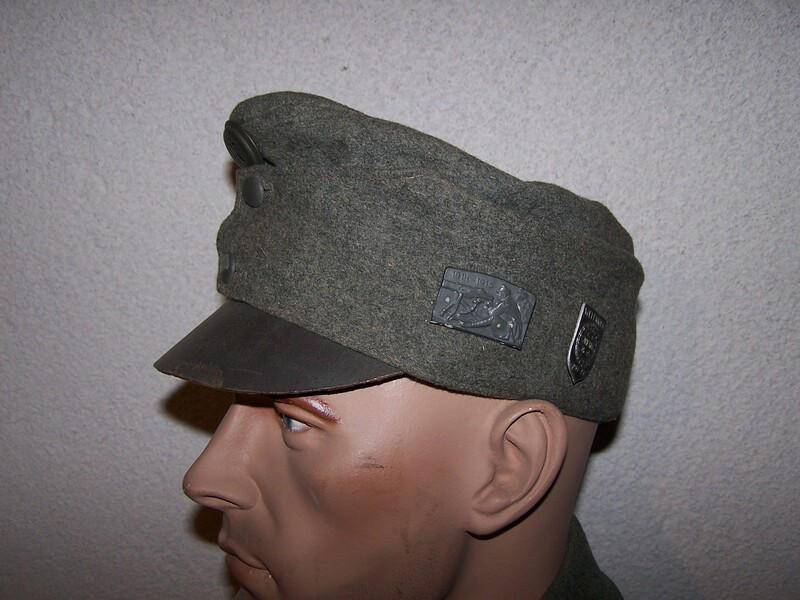 Recently @ the Show of Shows in Louisville, Kentucky I discovered a complete WWI Austrian uniform of field grey wool including: cap, tunic, britches and putties being offered by the legendary Jeff Schrader of Advanced Guard Militaria. After some friendly negotiations between Jeff & myself; we came to an agreement. 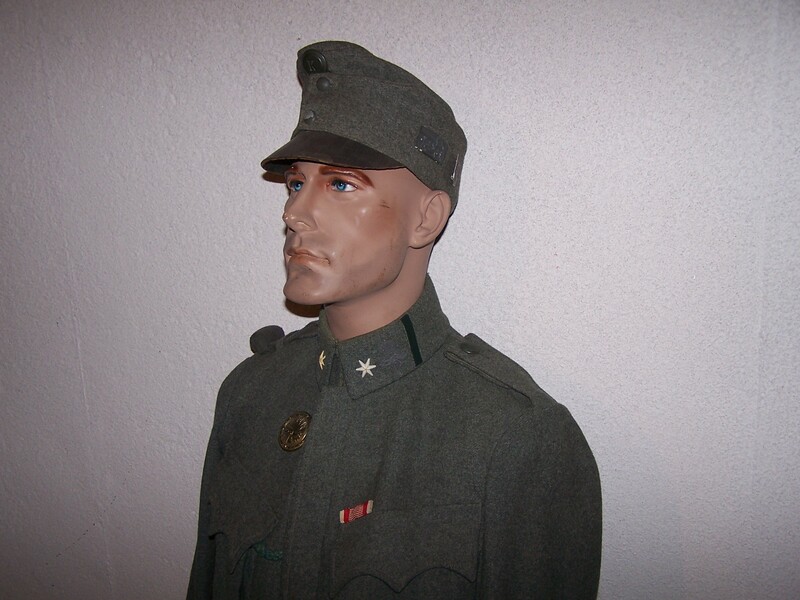 It’s a great set in wonderful condition, and came with the perfect mannequin, just the way you see it displayed. I’m sure you would like to know the price. Well, it was a biggie, but reasonable. I hope you enjoy the photos of this great piece of military history. Have you been to Prague, Czech Republic? You should plan a trip! It is with much rejoicing that I announce the release of my long time friend's book. Don't be a tight wad, and go buy your own copy. Please check bender publishing for more info. Garage saler extraordinaire E. Larry recently found a WWII US Army Cook's Manual. It includes many legendary period recipes including (as the GIs called it) SOS or Sh-- on the shingle. as it is for 100 men. General LaMay was the commander of the 20Th Army Air Force flying in the Pacific during WWII. He instituted the low level night fire bombing of Japanese cities including the firebombing of Tokyo March 9/10, 1945 in which 16 square miles of Tokyo were incinerated. His approach of firebombing Japan helped to end WWII, and resulted in more Jap fatalities than the 2 atomic bombs combined. This guy was not squeamish about doing what was required to get the job done, or burned sushi. We could use him in the war on terror. I recently revisited a friend's website, and he has his deadbeats and knuckleheads section where he lists the people who have caused him problems. I thought about the concept, but decided to turn it 180 degrees and make my list of great people that have been good to me; they deserve an "E" pat on the back. I am lucky to know them! My many thanks to the below listed individuals. Please be aware that this list is a work in progress, and by no way complete, and is in no particular order. My Wife Jane and Son Thomas without them what is the point of it all? My Mom & Dad for bringing me out of the communist workers paradise of Czechoslovakia, and giving me all I needed! Do you have a mess kit fund??? What, you don't know what a mess kit fund is??!! A mess kit fund a.k.a. a slush fund is where you put away a little bit of money every time you get paid or sell something. When I worked my regular job as a high school teacher I put away $20 from every check. 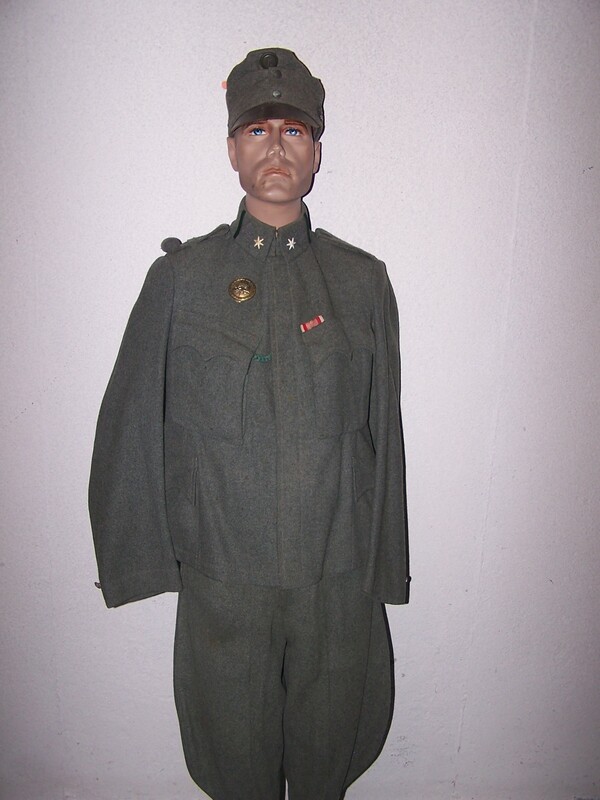 Now, I put some money in my fund after every militaria show and once a month when I deposit the checks from you. You will be amazed how fast the amount will grow. But, it takes discipline not to dig in there when you need a few bucks. Try to let it grow for a year. Then, when you see something really cool, on you favorite web site (which of course is SV Mitaria) you can use your secret fund to buy it. It is more fun to use some type of WWII container. I use a WWII Italian mess kit, and so have called it my mess kit fund. Good luck! 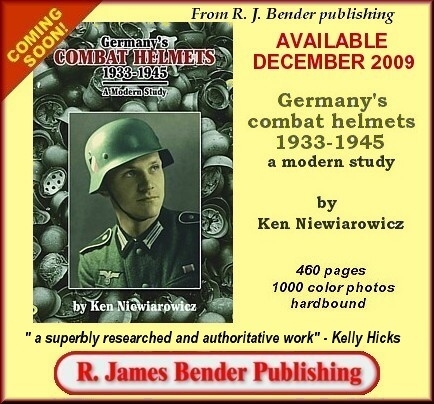 German WWI/WWII Cutout Helmet Info. They are always a size 64!!! They are always made by ET. 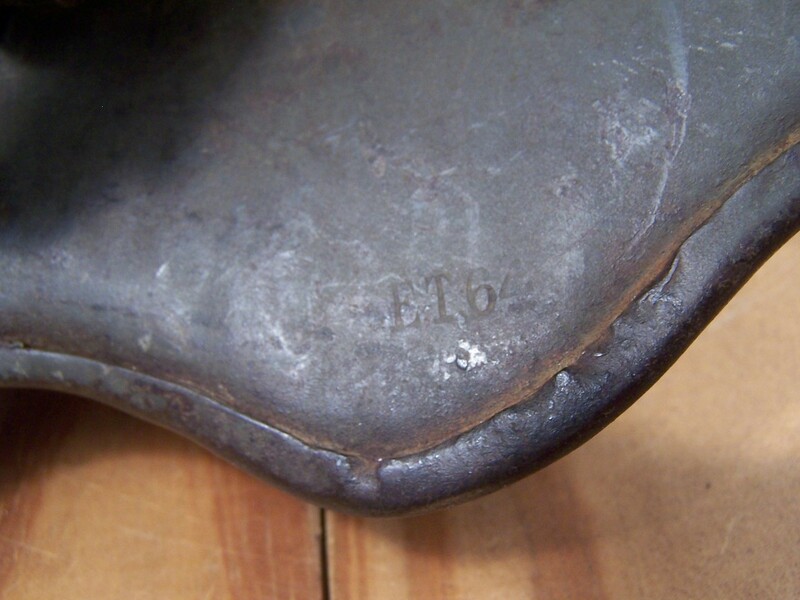 The placement of the ET64 stamp on a standard M16/18 helmet is in the area of the cut or scallop, so if a standard helmet has been made into a cutout, the ET64 will be missing. The Et46 stamp is located farther to the front on a real cutout. The edge will have an even roll or lip the points outward, not just an area where material has been removed. Please see the photos of original examples. Take the SS Collar tab challenge. 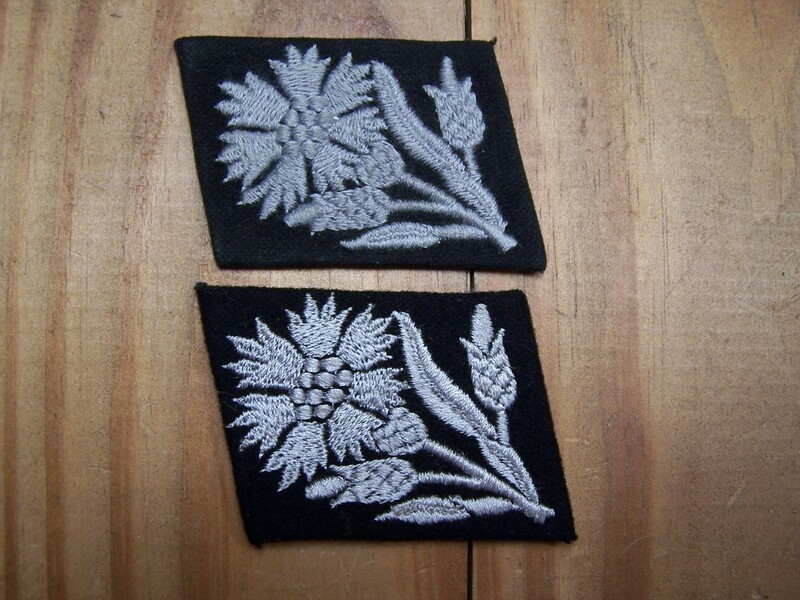 Which SS Calvary Division Maria Theresia tab is an original one and which is a made in the 1960s fake? Why? How do we tell? Neither glows under a black light, and both are the same in thickness! Click on the images for an enlargement. Answers are @ the bottom of this page. "I have been given a command in Southern Russia. That sounds like a nice warm place for some easy blitzkrieging." Friedrich Paulus. B is the original one. 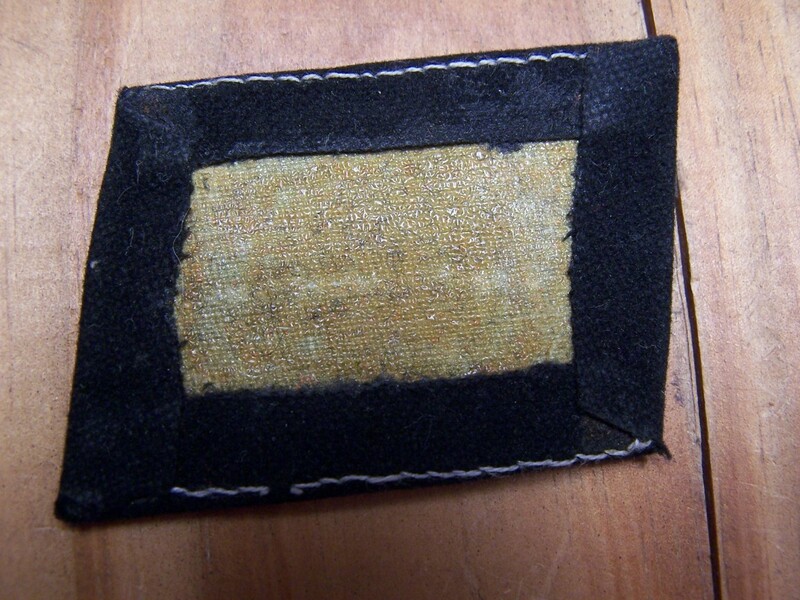 The background wool, on the original, should not have a checkerboard weave visible in the fake. 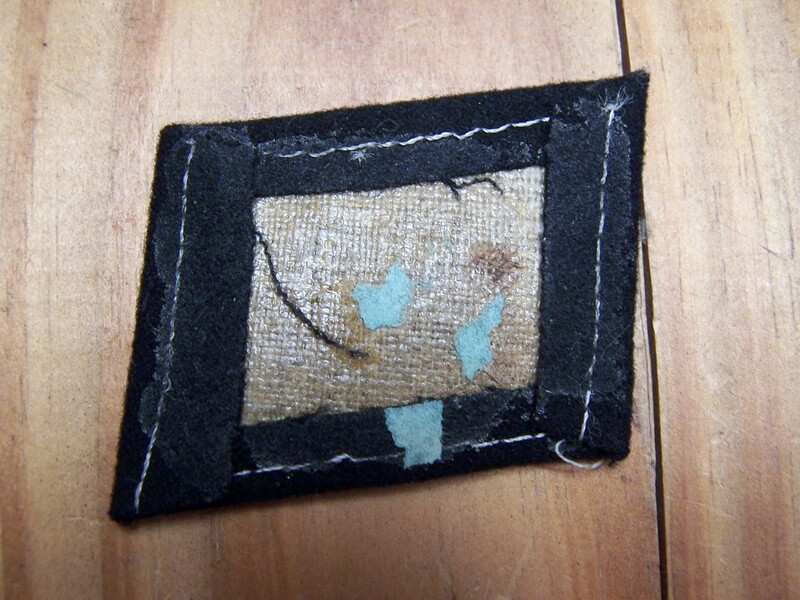 Also the post war example silver grey thread has some "fuzz" visible with a magnifying glass, but somewhat visible here. 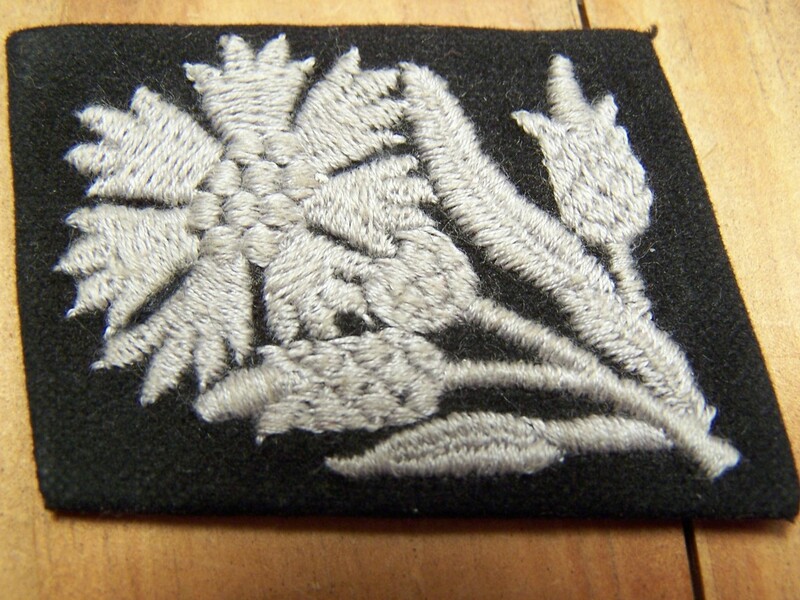 Original WWII era silver grey thread will have no fuzz under magnification. 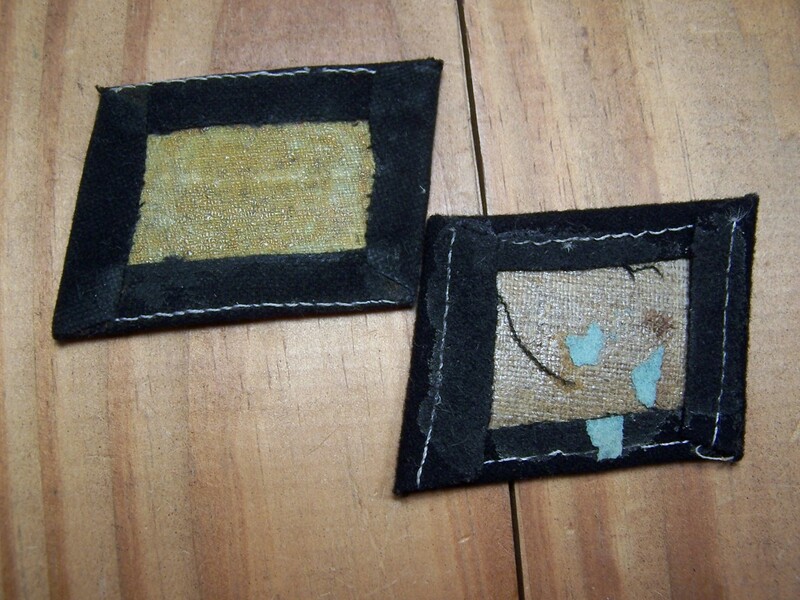 Use these two hints top help you with SS embroidered tabs. Caution, these replica tabs, available with most different divisional insignias, as well as skull and SS style, are offered for sale often. Many times they will have wonderful looking age to them! 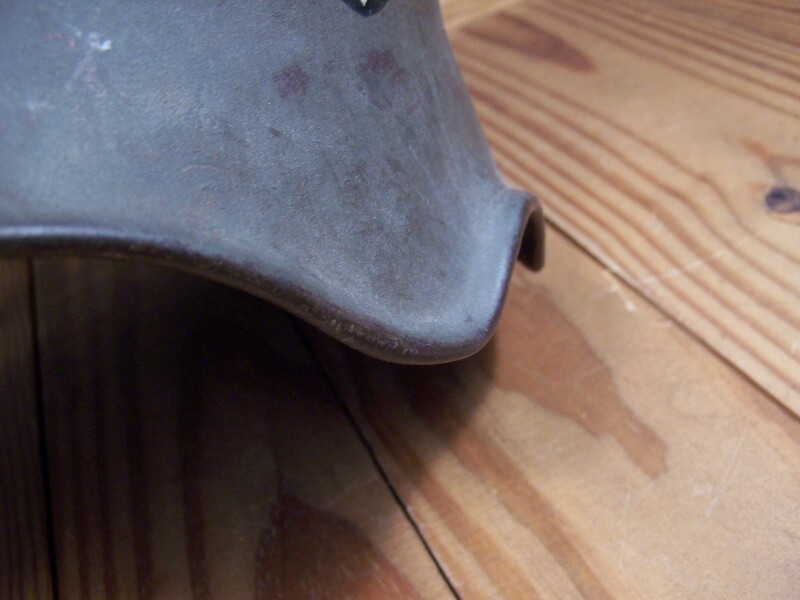 It's a WWII German pilot's steel helmet model SSK-90 shell missing the leather covering.